Saarland became a French Protectorate at the beginning of 1948. As a result, the new, quasi-independent state required their own postage stamps. On April 1, 1948, the thirteen new postage stamps and three new airmail stamps shown above (Mi. #239-54, Sc. #188-200, #C9-11) were issued. The new stamps were engraved on unwatermarked white paper. The 10 C. through 9 Fr. denominations were perforated 14 x 13, and the higher denominations were perforated 13. 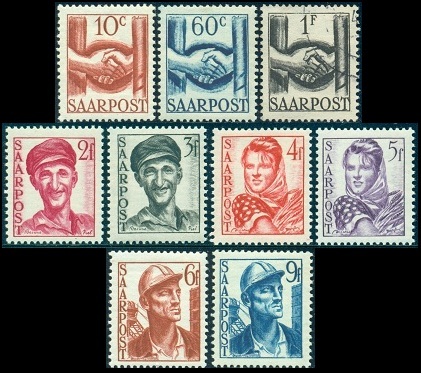 The eight new "reconstruction themed" postage stamp designs feature clasped hands, a worker, a girl gathering wheat, a miner, Colliery Shafthead, smelting, reconstruction, and Mettlach Abbey. 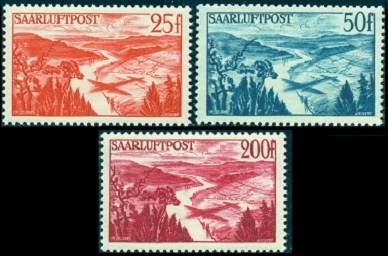 The three airmail stamps feature the shadow of a plane flying over the Saar River. On October 12, the four postal charity stamps and the airmail charity stamp shown above (Mi. #255-59, Sc. #B61-64, #CB1) were issued. The surtax was to raise money for the victims of the floods of 1947-1948. 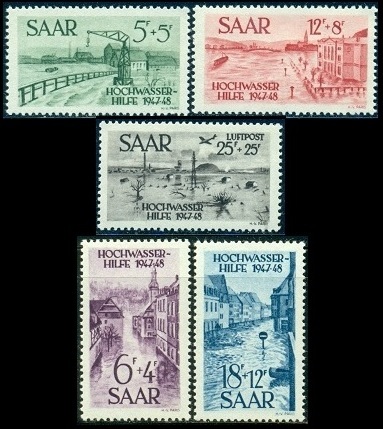 These "Flood Relief" stamp designs feature flooding scenes from the Saarbrücken and Saarlouis Areas. The two "Flood Relief" souvenir sheets shown below feature imperforate examples of the regular stamp designs. The larger sheet (Mi. Block 1, Sc. #B64a) contains the postal charity stamps, and the smaller sheet (Mi. Block 2, Sc. #CB1a) contains the airmail charity stamp. Only 38,000 were printed, and as a result, they are very scarce today. Used examples are RARE. The two commemorative stamps shown above (Mi. #260-61, Sc. #201-02) were issued on December 1, 1948. They commemorate the first anniversary of the establishment of the the Saar Protectorate. 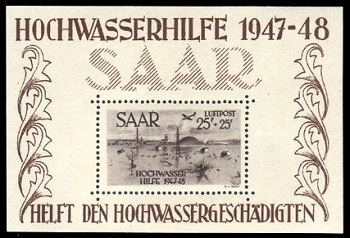 Both of the stamps depict a map of the Saar Protectorate. 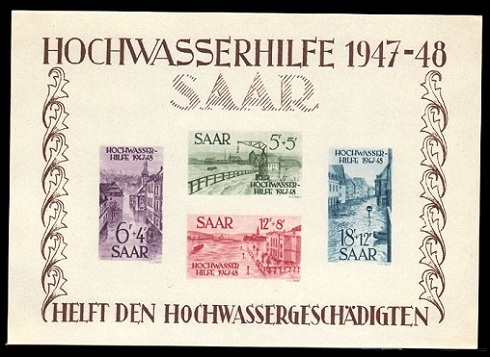 Due to their being printed in sheets with small panes, almost all Saar Protectorate stamps are available in gutter pairs, and some are even available in gutter blocks.